Search engine optimization (SEO) is an art of making your website friendly to search engines like Google and Bing/Yahoo! so that it will be listed top in the search results pages. SEO is as important as building a website with quality content and Weebly provides very useful SEO settings which can be done by yourself without depending on any external agencies. In this article we will discuss all possible settings you can do to improve your Weebly site’s search ranking. Site level settings under “Settings” tab. Individual page level settings under “Pages > Individual Page > Advanced Settings“. Before we discuss SEO settings on Weebly, first let us have look on a search result in Google to understand different elements. The “Site Title” comes from the site settings and all other elements are relevant to individual page’s settings. Site address is your domain name and ensure to use a custom domain for your Weebly site to get better results in search engines. You need to upgrade to a minimum of starter plan in order to connect your custom domain. Set your site’s title which will be displayed in search results at the end of Page Title. Generally, site title could be your domain name itself or your business brand. Use the description effectively with single or two words and do not stuff site title with many keywords. Since site title appears on each search results links, this is most important for SEO as well as branding. Ensure to select the checkbox “Show title on the top of your pages”. SSL is not only a must for sites selling online products nowadays search engines also provide more weightage for secured https:// sites compared to other http:// sites. With SSL users will access the site content over 128-bit encrypted connection and a lock icon will also be displayed in the browser’s address bar to indicate your site is secured. You can also allow the buyers to checkout on your own domain thus increase the confident and security with SSL. But Weebly only offers SSL as free with business ecommerce plan. Favicon is though not affecting your SEO it is also displayed on browsers and on some search engine results like Yandex thus improving your brand visibility. Learn how to add Favicon to your free Weebly site. Facebook Sharing option allows you to connect your Facebook profile or page and automatically share the blog posts with your followers. This is a simple and effective way to promote your site content for free. Mobile Site – All new responsive themes are by default mobile device compatible and there is no need to do any action. You will not see any mobile settings if you use a responsive theme. Non-responsive theme users can enable “Display mobile optimized version…” checkbox under so that Weebly will automatically setup a mobile redirect and display your mobile site when opened in mobile devices. Site description is used as a Meta Description when your home page is shown in the search results. Use descriptive words to explain the purpose of your site to encourage users to click on it when shown as excerpt in the search results. 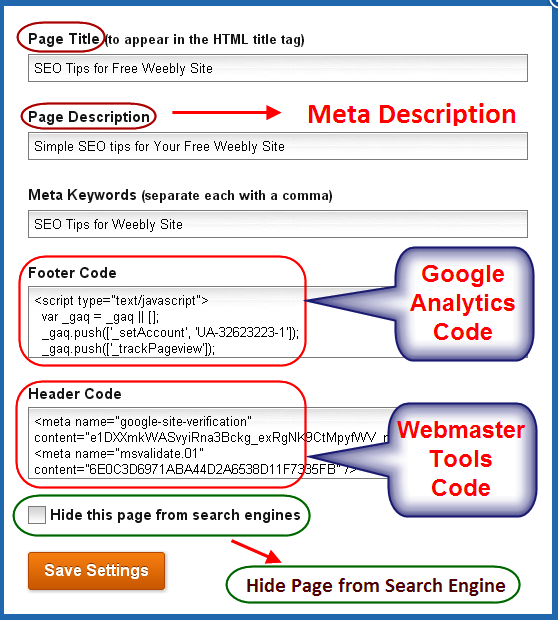 Google Analytics Tracking – Paste your Analytics tracking code at site level in the Footer Code section. You can add Analytics tracking id for your store under “Store > Advanced” settings. Webmaster Tools Code – Verify your site with Google, Bing, Yandex and Baidu webmaster tools by pasting code in Header Code section at site level. Select the option “Hide Site from Search Engine” in order to automatically set your robots.txt file and disable search engines from indexing your site. Whenever you change the URL of a page or blog post set 301 redirects to retain the search engine ranking of the previous page. Learn more about setting up of Weebly 301 redirects here. Similar to site level settings page level advance setting options allows you to set page title and meta description for page each individual page. Page Title – Ensure to add a page title for each of your page with not more than 57 characters (including site title) otherwise it will get truncated in the search results. Also don’t forget to use the focus keywords of the page on the title. Page Description – Enter 160 – 180 characters descriptive sentences explaining the excerpt of your page content. This will be shown as a meta description in search results and important for encouraging users to click on the results. Header and Footer Code sections are used for Analytics and Webmaster Tools code or any other purpose to add codes applicable only for that page. You can also hide your page from search engines by selecting the check box “hide this page from search engines”. Alternative Text or ALT text is a text used by search engines to identify your image content and index the images in the database. By default Weebly set this ALT text of all the images to “Picture” and you can change it as per your image description under “Advanced” option. Learn more about SEO for images here. Weebly offers a dynamic Sitemap and Blog feed. You can submit both Sitemap as well as Blog feed to the search engines in your Webmaster Tools account. Weebly Sitemap format is “www.your-site-name.com/sitemap.xml” and the Sitemap will dynamically get updated whenever you publish new pages or change the existing URL. Hence submitting the Sitemap once in the webmaster tools is sufficient. Weebly blog feed format is “http://You-blog.com/1/feed” and the blog feed can also be submitted to search engines. Weebly’s drag and drop title element adds a H2 heading by default which is not good for SEO when there are many H2 headings through out your page. Hence, hence organize your content and use appropriate headings from H1 to H6 whenever required. Learn more how to do this here. Above all content is the key for successful SEO and ensure that your keyword is part of content, title and description so that it will be highlighted in the search results pages. 404 page though not going to affect your site’s SEO, it disappoints users who landed on your site looking for something. Default Weebly’s 404 page not found page does not offer any additional customizing options and hence design you own 404 page with search box and useful links to offer visitors an alternate to look for. Similar to site and page level settings, for blogs, the blog level settings are available under “Settings > Blog” and individual post level settings are available under “Post Options > Advanced“. Enter SEO post title and SEO post description for each posts since they will appear in search results like individual pages. Meta keywords are not used by search engines, hence you do not need to use this for SEO purposes. can you somehow add alt text for the logo image? Check your site’s robots.txt file with the URL – yoursite.com/robots.txt. If you find the below lines then your site is blocked for search engines. We understand from users that Weebly changed the indexing options (probably for new users and for blogs) that allowing search engines need upgrade to premium plan. This new change in Weebly makes free websites useless. Now it’s pay or move away! Fortunately there are many other free hosting options. P.S. Using the 301 redirect function for url “robots.txt” seems to work, at least temporarily. That’s how free things work!!! Weebly guys don’t have the habit of communicating to users on such big changes. Last year they tried with limiting number of pages to 5 for free users then reverted the changes and now disallowing search engines. Since they have updated this in the pricing plans we also don’t think this will be reverted. We monitored for the past few months – the changes were reverted back quietly and the search engine indexing option was also removed from the pricing plans allowing all free sites to be indexed. unfortunately, your article is not up to date..
for now, weebly disable a new blog from search engine indexing via robots.txt ..
Is there a way to edit the robots.txt file? Would it be possible to edit? I share the same concerns with Robert. I too have published a online help site a few weeks back. And until now it has not been indexed by Google. I tried searching for the exact URL in Google, came back with no results. Is it possible that the rest of the site still says “Under Construction”? but this url/support/onlinehelp.htm is complete and should show up on Google search after a few days right? But it’s been over two weeks and still not indexed at all. There are no strict guidelines when the page / post should be indexed by Google, sometimes it is on the same day and sometime even it takes months. Even if the exact URL does not show up we do not see there is a problem with Weebly. Please check your Google search console account and ensure you have submitted XML Sitemap and the last date of crawling. You can also use “Fetch as Google” option to manually submit the particular URL and request Google to index it. As a note – hide all those under construction pages from search engines and ensure they are blocked with robots.txt and not part of Sitemap. So is there a way to edit the robots.txt on weebly? How do I block them with robots.txt? I thouth it was not possible to edit the robots.txt file on Weebly? Robots.txt file entries will be automatically created when you hide a page from search engines under “Advanced” settings of “Pages” tab. I am concerned…it seems that content I write…specifically blog posts do not show on google results. The blog posts I place on blogspot make the rankings…even my old website shows. Weebly…nothing. Google does see it, but only if I use keywords that go to a painful level that no normal human would. I.E. I have to search “my website domain exactly” and “subject”. I know you can’t help this…it is part of your engineering…just disappointing is all. 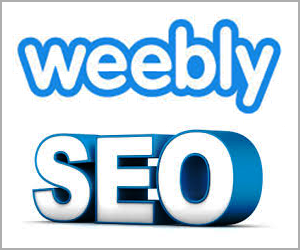 I’ve read several posts on SEO for weebly sites but I must say your article was truly helpful, thank you. I’ve now added my site to google analytics and hope to be able to track improvements soon. my weebly don’t have Mobile Settings Tab, why.? Mobile option is now moved under “General” settings tab. You will also not see “Mobile” option under “General” settings tab if you use responsive theme. How about Alt text for product images?? there is no separate alt text for product images. As for as i can see, these images are not shown in Google image search. Product search uses description and title which are part of the Weebly products as well. Alt text isn’t available in latest version of weebly, is there an HTML workaround? We can see Alt Text is still available under Advanced option. Alt text is only available for stand-alone images — not gallery items and product images. However, you can add a caption. I haven’t looked at the HTML, but this might be a tag that Google still recognizes in lieu of an Alt tag.